Mayor Lutfur’s decision to commit £3million of council money to paint domes, polish signs and refurbish faith-based community centres has caused a bit of a stink within the Labour party. Many members are deeply unhappy that scarce public money is being spent to fund religious activities, particularly given some of those religious activities do not promote the kind of equality at the heart of their party’s values. I asked them for a statement on their position on Tuesday and they sent it yesterday evening. Cllr Sirajul Islam, leader of the Labour group, said: “We strongly support our many faith communities and the good work that they do in supporting local people. Many organisations will have applied for this funding in good faith to continue the work that they do which strengthens our communities. “We do not want any of our faith organisations to be stained by the grubbiness of the mayoral administration. “There is a strong perception that this funding is being used to put pressure on people to support the Independent Mayor at the next election. It is wrong to seek to buy an election with local people’s own money. “The Mayor does have a duty to explain to the people he is meant to serve how he has balanced these needs against the many other pressing needs in our community, as families face a lack of school places, social care budgets are squeezed, street cleaning cut and local people badly need help with getting jobs. There are many unmet needs in Tower Hamlets. “We would not seek to reverse these decisions unless there was clear evidence of any corruption or wrongdoing. “Labour Group have expressed our concern at the Mayor’s profligate approach to the Council’s finances and with this decision coming only days before the Conservative led Government announces further destructive cuts to the Council’s budget, we would urge the Mayor to ensure he is taking every step possible to safeguard the core services residents rely upon. I then asked Labour’s John Biggs, who will challenge Lutfur for Mayor next year, whether “not seek to reverse these decisions” meant he would guarantee the entire £3million committed to this scheme. So that’s not a guarantee. This is a tricky issue in Tower Hamlets. 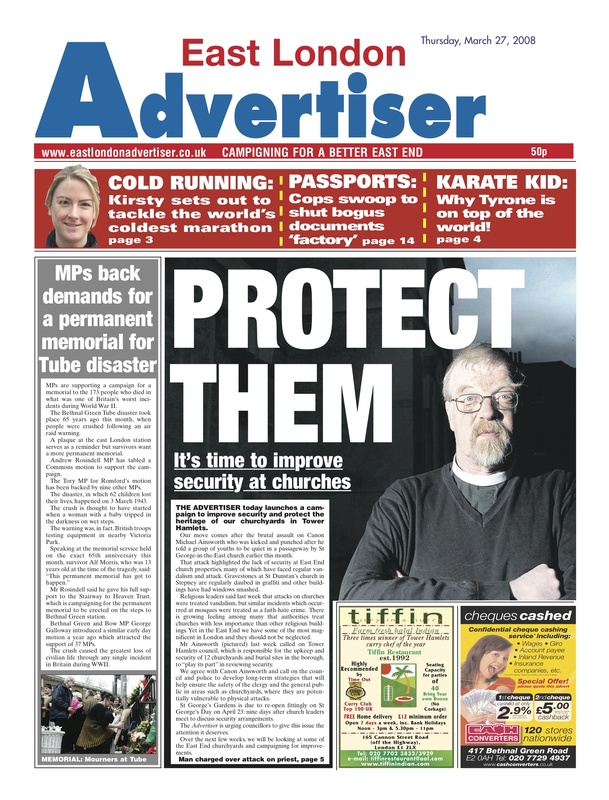 In March 2008, a couple of weeks after Canon Michael Ainsworth was beaten up in the grounds of St George-in-the-East church in Shadwell, the East London Advertiser carried a front page editorial backing his call for “the council to to play its part” in improving security at the borough’s churchyards. Lutfur was council leader at that point and while there were mumbles of “things must be done”, I don’t recall anything actually happening. Some of these historic churchyards remain vulnerable to violence and anti-social behaviour. As Canon Michael’s call was about securing churches from violent elements in the borough, the money that he wanted used would have come from “community safety” budgets. That’s very different from paying for the running costs of churches and mosques etc. Incredibly, £2,400 of the £15,000 Lutfur has given to the Aberfeldy mosque is for “sessional staff, management, ie Meetings, minutes, diary, letter…and £595 is for refreshment/volunteer cost/travel cost”. So this means our council tax is being used to fund that mosque’s own salaries and expenses. Again, that’s very different from painting and decorating. This is the danger of this policy: it creates a link between the state and religion, and in Tower Hamlets that really means between the council and Islam and the Council of Mosques. It sets a precedent for more money. 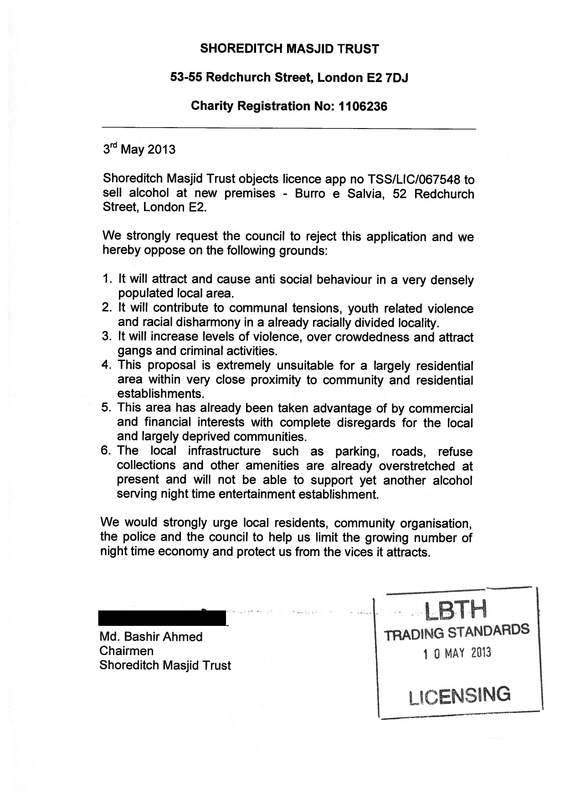 Another recipient of Lutfur’s largesse is the Shoreditch Masjid Trust in Redchurch Trust, just north of Brick Lane. It’s been awarded £25,000 to fund “improvement works”. The Shoreditch mosque is listed as following the Deobandi tradition, which is closely linked to the Saudi Wahhabis’ outlook on life. And for a flavour of that, let’s have a look at an objection they made last night at the council’s licensing committee. The committee was hearing an application for an alcohol licence for the small Burro e Salvia Italian deli opposite the mosque. The deli, which sells pasta, ham and cheese, and has seating for 12 people, wanted to sell wine until 7pm when it closes. But this outraged the members of the mosque, which submitted two letters and a petition against it. Isn’t the language depressing? That a small, innocuous Italian deli could be accused of driving up levels of crime and racism…well, it’s the kind of argument you’d hear in Islamic republics. And we’re giving them £25,000. Bit sickening really. A fortnight ago, Roy Greenslade, the Guardian’s media commentator and professor of journalism at City University, reported here the view of Communities Secretary Eric Pickles that members of the public could film council meetings. I want to stand up for the rights of journalists and taxpayers to scrutinise and challenge decisions of the state. Data protection rules or health and safety should not be used to suppress reporting or a healthy dose of criticism. Modern technology has created a new cadre of bloggers and hyper-local journalists, and councils should open their digital doors and not cling to analogue interpretations of council rules. Councillors shouldn’t be shy about the public seeing the good work they do in championing local communities and local interests. His comments came as he issued new guidance on what councils should do to make their meetings more transparent. Can I film the meeting? Council meetings are public meetings. Elected representatives and council officers acting in the public sphere should expect to be held to account for their comments and votes in such meetings. The rules require councils to provide reasonable facilities for any member of the public to report on meetings. Councils should thus allow the filming of councillors and officers at meetings that are open to the public. The Data Protection Act does not prohibit such overt filming of public meetings. Councils may reasonably ask for the filming to be undertaken in such a way that it is not disruptive or distracting to the good order and conduct of the meeting. As a courtesy, attendees should be informed at the start of the meeting that it is being filmed; we recommend that those wanting to film liaise with council staff before the start of the meeting. The council should consider adopting a policy on the filming of members of the public speaking at a meeting, such as allowing those who actively object to being filmed not to be filmed, without undermining the broader transparency of the meeting. Just a few hours before its full council meeting tonight, the most senior officer at Tower Hamlets, Stephen Halsey, has just given the minister a two-fingered rebuff. I thought it would be useful to clarify a couple of points where questions have arisen in relation to Wednesday evening’s Council meeting. Some Members expressed concern at the April Council meeting that no officer was present with delegated powers from the Monitoring Officer to advise on a potential amendment to the Constitution. The Monitoring Officer is currently on leave and will not be present at Wednesday’s meeting. A senior legal officer will be in attendance with delegated powers to advise on legal matters but this does not include power to agree any changes to the Constitution. This is in line with the requirement in the Constitution itself, that such changes may only be made by the Council after consideration of the proposal by the Monitoring Officer. Unless the proposed change is considered to be ‘trivial’, some time will be required for this consideration. It would be helpful if Constitutional changes were not the subject of late motions moved with little or no notice. If such changes are moved, it may be necessary for officers to take the proposal away and report back to a subsequent meeting. More generally, the submission of late motions or other items without notice to the Council meeting does not promote considered decision making or transparency. The rules around giving notice of proposals are there for a reason, and all proposals put to the Council should be subject to appropriate officer advice. I would therefore ask all Members to refrain from moving late items on any subject unless it relates to a genuine emergency. I am aware that there are comments circulating on the web suggesting that Wednesday’s Council meeting will be filmed, presumably by someone in the public gallery. These follow a statement issued by Eric Pickles MP in which he apparently indicated that the Government has changed the law so that Councils must allow people to blog, tweet and film meetings. I should clear up a misapprehension in this regard, in relation to the Council meeting nothing has changed and there is no obligation for the Council to allow members of the press or public to film the meeting. The Council’s Constitution provides that ‘No photography or video or audio recording of any kind by Members, guests or members of the public may take place at any Council meeting without the express permission of the Speaker’ (Council Procedure Rule 27.1), and this remains the case. Where requests have been made to previous Speakers to give such permission, officers have advised that this should not be agreed and this remains my position for a number of reasons. These include possible reputational damage to the authority – or worse, action against individuals – resulting from publication of material that may be a partial record of events, presented out of context or even edited to be misleading; and the potential infringement of individuals’ rights to privacy, including members of the public and officers who have not given their permission to be filmed. Officers have therefore advised the Speaker that, in their view, she should not agree any request from a third party to film the meeting and I understand that the Speaker has supported that position. Looking forward it may be possible to agree arrangements for the Council’s own video service to address the above points in a considered way and promote the transparency that we all support. However I do not consider that allowing unregulated and potentially damaging third party filming is the best way to achieve this, particularly as there is, in fact, no requirement to do so. Reputational damage?? To Tower Hamlets council?? So, he’s saying the council’s constitution specifically bars filming. And any change to the council’s constitution would need the consideration of the Monitoring Officer. But because she (Isabella Freeman, who is in the middle of suing her employer, remember) has been allowed to take a holiday on the night of full council meeting, any proposed amendment would not likely see the light of day. And with that decree (sent, ironically, just a few hours before proceedings), our highly paid officers have ensured darkness remains over the monthly disgrace that is our full council meeting. Thanks for offering me a chance to comment on the Mayor’s decision to allocate £595,000 to the improvement of faith buildings in the Borough. I’m going to come at this topic in a slightly oblique way but I hope you’ll see the point I’m making. In Perth, Western Australia, where I was born, the Swan River holds great significance to the Noongar aboriginal people. The water is sacred because a dreamtime spirit in the form of a snake called the Waugal created the river on its journey to the sea. The Swan River is ‘sacred’ for me too, but not in the same way that it is for the Noongar. For me, a non-believer and member of no church, I feel a similar sense of attachment to faith buildings in Tower Hamlets, and that’s why I support the policy of the Council contributing to their upkeep. Of course, all Council spending has to be justified, and especially so when there are reductions in government grant. Last year Tower Hamlets Council had a reduction of 7% of its net revenue budget. But even after cuts we are a Council that spends £1,327 million per year. This year, we are increasing the level of general reserves by £11.7 million to £38.1 million. Unlike some other Councils, Tower Hamlets Council’s finances are in good shape. However £595,000 is a significant amount and could be spent in other ways. Some people will think that it should be spent elsewhere – because to spend it on faith buildings is to privilege religious groups at the expense of others. To my knowledge there are no places that are “atheist only” in the Borough. But as an atheist, I have enjoyed concerts in St Leonard’s Church, discussed books in the lovely Nelson Street synagogue, seen history exhibitions in the London Muslim Centre. I love hearing the bells ringing out from St Anne’s Limehouse and am moved by the annual service to remember the victims of the Bethnal Green tube disaster at St John’s Church. Like many residents, religious and otherwise, I also sit in Museum gardens, use the Idea Stores, cycle around Victoria Park, and go to events at York Hall. All of these places have been developed with public funding and are supported by Tower Hamlets Council. Secular buildings and spaces that are welcoming to all enrich our Borough. Religious buildings can do so as well. I appreciate that not everyone wants to visit a church, mosque, synagogue or temple. I will never use the Mile End skate park but I’m happy for it to be there and to make my contribution to its costs. Places and buildings are important to different people for different reasons. I do not believe the Waugal lives in the Swan River. But the river is a mystical place for me in my own way. There are faith buildings and secular buildings in Tower Hamlets that are special or sacred for one person or another. I think it’s good that the Council helps to preserve and enhance faith buildings as it does secular buildings and places. To do otherwise would be to deprive us all. It would make a good Church sermon, this.